Marijuana is a green or gray mixture of dried, shredded flowers and leaves of the hemp plant Cannabis sativa. There are over 200 slang terms for marijuana including “pot,” “herb,” “weed,” “boom,” “Mary Jane,” “gangster,” and “chronic.” It is usually smoked as a cigarette (called a joint or a nail) or in a pipe or bong. In recent years, it has appeared in blunts. These are cigars that have been emptied of tobacco and re-filled with marijuana, often in combination with another drug, such as crack. 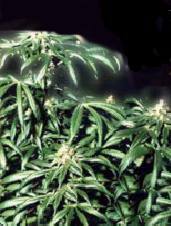 Some users also mix marijuana into foods or use it to brew tea. The main active chemical in marijuana is THC (delta-9-tetrahydrocannabinol). In 1988, it was discovered that the membranes of certain nerve cells contain protein receptors that bind THC. Once securely in place, THC kicks off a series of cellular reactions that ultimately lead to the high that users experience when they smoke marijuana. The short-term effects of marijuana use include problems with memory and learning; distorted perception; difficulty in thinking and problem solving; loss of coordination; and increased heart rate, anxiety, and panic attacks. Scientists have found that whether an individual has positive or negative sensations after smoking marijuana can be influenced by heredity. A recent study demonstrated that identical male twins were more likely than nonidentical male twins to report similar responses to marijuana use, indicating a genetic basis for their sensations. Identical twins share all of their genes, and fraternal twins share about half. Environmental factors such as the availability of marijuana, expectations about how the drug would affect them, the influence of friends and social contacts, and other factors that would be different even for identical twins also were found to have an important effect; however, it also was discovered that the twins’ shared or family environment before age 18 had no detectable influence on their response to marijuana. Researchers have found that THC changes the way in which sensory information gets into and is acted on by the hippocampus. This is a component of the brain’s limbic system that is crucial for learning, memory, and the integration of sensory experiences with emotions and motivations. Investigations have shown that neurons in the information processing system of the hippocampus and the activity of the nerve fibers are suppressed by THC. In addition, researchers have discovered that learned behaviors, which depend on the hippocampus, also deteriorate. Recent findings indicate that smoking marijuana while shooting up heroin has the potential to cause severe increases in heart rate and blood pressure. In one study, experienced marijuana and heroin users were given marijuana alone, heroin alone, and then a combination of both. Each drug alone produced cardiovascular effects; when they were combined, the effects were greater and lasted longer. The heart rate of the subjects in the study increased 29 beats per minute with marijuana alone and 32 beats per minute with heroin alone. When the drugs were given together, the heart rate increased by 49 beats per minute, and the increased rate persisted for a longer time. The drugs were given with the subjects sitting quietly. In normal circumstances, an individual may smoke marijuana and inject heroin and then do something physically stressful that may significantly increase risks of overload on the cardiovascular system. A study of college students has shown that critical skills related to attention, memory, and learning are impaired among people who use marijuana heavily, even after discontinuing its use for at least 24 hours. Researchers compared 65 “heavy users,” who had smoked marijuana a median of 29 of the past 30 days, and 64 “light users,” who had smoked a median of 1 of the past 30 days. After a closely monitored 19- to 24-hour period of abstinence from marijuana and other illicit drugs and alcohol, the undergraduates were given several standard tests measuring aspects of attention, memory, and learning. Compared to the light users, heavy marijuana users made more errors and had more difficulty sustaining attention, shifting attention to meet the demands of changes in the environment, and in registering, processing, and using information. The findings suggest that the greater impairment among heavy users is likely due to an alteration of brain activity produced by marijuana. Any drug of abuse can affect a mother’s health during pregnancy, and this is a time when she should take special care of herself. Drugs of abuse may interfere with proper nutrition and rest, which can affect good functioning of the immune system. Some studies have found that babies born to mothers who used marijuana during pregnancy were smaller than those born to mothers who did not use the drug. In general, smaller babies are more likely to develop health problems. A drug is addicting if it causes compulsive, often uncontrollable drug craving, seeking, and use, even in the face of negative health and social consequences. Marijuana meets this criterion. More than 120,000 people seek treatment per year for their primary marijuana addiction. In addition, animal studies suggest marijuana causes physical dependence, and some people report withdrawal symptoms. The NIDA-funded MTF provides an annual assessment of drug use among 12th, 10th, and 8th grade students and young adults nationwide. After decreasing for over a decade, marijuana use among students began to increase in the early 1990s. From 1996 to 1997, use of marijuana at least once (lifetime use) increased among 12th and 10th graders, continuing the trend seen in recent years. The seniors’ rate of lifetime marijuana use is higher than any year since 1987, but all rates remain well below those seen in the late 1970s and early 1980s. Past year and past month marijuana use did not change significantly from 1996 to 1997 in any of the three grades, suggesting the sharp increases of recent years may be slowing. Daily marijuana use in the past month increased among 12th graders, but decreased among 8th graders; this pattern of increases among older students and stable or declining rates among younger students was found with several indicators in the 1997 MTF.